This page is dedicated to showing readers more about Moscow, the beautiful capital of Russia. добро пожаловать в москву! (Welcome to Moscow!) Moscow (Москва) is over 860 old and the beautiful capital of the Russian Federation. This global city located in European Russia is “the centre” as Russians like to call it. While not the geographical centre of Russia, Moscow embodies Russia’s heart and soul. Around the world, the sight of Red Square and the towers of the Kremlin represent the symbolism of Russia’s long and colourful history. Saviour Tower of the Moscow Kremlin. You’ve landed at Moscow’s Sheremetyevo (SVO) international airport, one of three busy airports in Europe’s second largest city. Soon you find yourself in a car bound for the city centre, and that will take you on the Leningradskoe Highway. 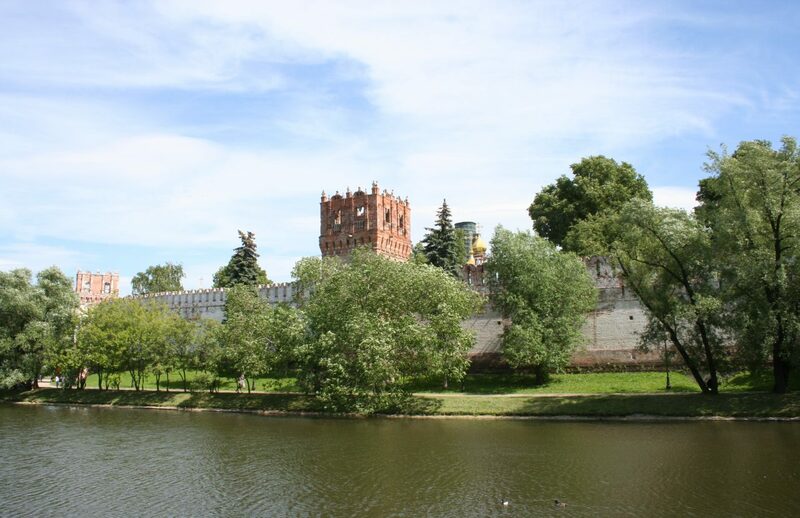 You will pass lots of interesting places such as the first IKEA and MEGA stores in Moscow, past the Peterhof palace, and lother spellbinding sights. Depending on traffic, your ride to the centre can be as quick as about 55 minutes, or as long as 3+ hours. Hint: take the Aeroexpress which is cheap direct train from the airport to Belorusskaya stations — and only 40 minutes travel time. SVO is technically located in Khimki, a town of the Moscow Oblast, but as Moscow controls the airport, everything along the highway is governed by the city of Moscow. The massive multi-lane expressway eventually passes the MKAD ring road and soon slightly reduces to a large and bustling avenue called Leningradsky Prospekt. Very soon afterward you will see the large Belorusskaya train (and Metro) stations. Across the highway and opposite the Belorusskaya train (and Metro) stations, there is a large and very beautiful church. It is stunning for a number of reasons, the first is that it is indeed a beautiful thing of art. Another reason why most of us find it breathtaking is the location–here is a very old and beautiful church surrounded by tall and very modern office buildings in the midst of a large city. Like finding an oasis in the middle of a concrete and glass forest, the Church of Saint Nicholas on Tverskaya Zastava belongs to the Old Orthodox believers. Construction began in 1914 but the church was not consecrated until 1921, after the Bolshevik revolution. The Communists seized the property and closed the church in 1935. It took on a variety of uses and finally became an art studio. It was in this studio that sculptor Sergey Orlov created his monument of Yuri Dolgoruky, “Yuri the Long-Armed,” known as the founder of Moscow. When you visit Moscow, here is a map showing the location of the Belorusskaya train stations as designated by the large red M sign for ‘Metro” and in Russian language the location of the church is marked opposite the highway. The plaza surrounding the church is called the White Square Business Centre. In 1993 the government returned St Nicholas church to The Russian Orthodox Old-Rite Church. After restoration of the interior and the crosses on top, services resumed in 1995. We will bring additional resources to this page in the coming weeks.